Low Voltage Circuit Breakers - How to mount them? Low Voltage Circuit Breakers – How to mount them? Eric S., one of our dear members sent us this article last week. Thank you, it’s much appreciated and we’re sure that you all will love this too. 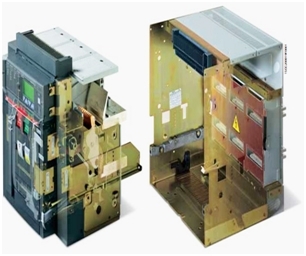 Ready to discover the different way of mounting LV Circuit Breakers? Hi everybody, this is Eric. I think this community is one of the most interesting ever and I wanted to contribute. Before we go on to discuss about different methods of mounting low voltage circuit breakers, let me give you a brief introduction about low voltage circuit breakers. Low voltage power circuit breakers, are essentially the prime electrical devices used in low voltage power distribution systems to protect electrical circuits, and subsequently all electrical equipments, from all types of fault currents, short-circuit and overloads. Though fuses are also capable of performing the same functions, they have to be replaced each time they detect a fault current or short-circuit, because they get blown off. Unlike fuses, low voltage circuit breakers can be reset to their normal condition, either automatically or manually, after they get tripped due to fault currents, short-circuit and overloads. Now that we know the importance of low voltage power circuit breakers in protecting valuable electrical equipment, we will now focus on the different methods of mounting them on to the electrical circuits. Let us now understand each method in detail. In this type of mounting, low voltage power circuit breakers are generally fixed permanently on to the electrical circuit with the help of bolts. Under its enclosure, the breaker remains bolted permanently and its wires are connected to load that is to be supervised. These types of circuit breakers are generally front mountable, and have a typical withstanding voltage of 600V or lower. Power supply to the circuit breaker is passed through a sectional bus bar or normal electrical wiring. Note: Power supply to the circuit breaker should be switched off before removing fixed these types of fixed circuit breakers manually. These types of circuit breakers have two parts. One part is known as the ‘base’, which connects to the electrical circuit frame and remains bolted. 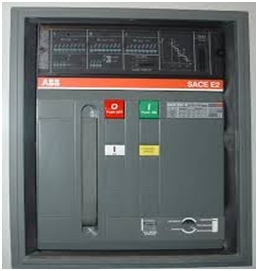 The other part is the actual circuit breaker which is equipped with insulating material connecting the base, non-electrically. The most important advantage of using this type of mounting is that, there is no need to re-wire the entire unit when the breaker alone is being replaced. Put simply, wiring will remain intact even when the unit is being replaced, thus reducing re-wiring time and costs involved to do so. Note: This kind of mounting method is suitable for circuit breakers with a typical rating of less than 600V. 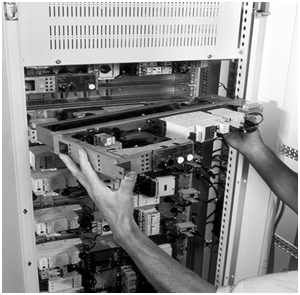 Power supply to the circuit breaker should be switched off while replacing the breaker. This mounting method also exercises two parts, base and the actual breaker. While the base is bolted as its wires connect the frame, actual breaker mates with the energized base with the help of insulators. There is no need to switch off the mains supply while removing the actual breaker from the unit. 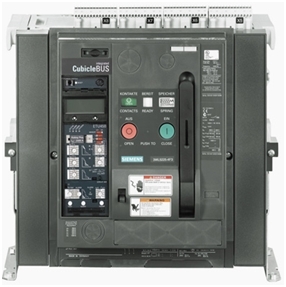 One can disconnect single faulty circuit breaker for repair or replacement, while others continue to function normally without any interruption. Note: Feeder to the circuit breaker should be turned off when testing the unit, or removing the entire unit along with its base. Though these circuit breakers are designed such that the power is turned off automatically as soon as you start isolating the breaker, for your safety, it is always advised that you turn the mains off, just in case. Above mentioned are the three main mounting methods of low voltage power circuit breakers. Depending on the usage, and frequency of replacement, one can opt for the mounting method that best suits their electrical needs. or copy this trackback: http://engineering.electrical-equipment.org/electrical-distribution/low-voltage-circuit-breakers-how-to-mount-them.html/trackback from your own site. Good day, Sir/Ma, please I want to learn and alsa pertinership with your company. How to produce electrical energy with olive waste?